user warning: UPDATE command denied to user 'icde2011_wp'@'server2.l3s.uni-hannover.de' for table 'dp_cache_filter' query: UPDATE dp_cache_filter SET data = '<p><strong>The industrial track is the forum for high quality presentations on innovative commercial software for all facets of information technology. We especially encourage submissions on commercial software or industrial-strength prototypes that are in wide use. These include significant applications leveraging database technology, innovations in data management platforms (including cloud data services) and middleware. Contributions on analysis of usage and effectiveness of existing technology/systems, best practices in the industry, perspectives on industrial trends and directions are welcome. We also invite proposals for entire sessions, to be sent by email to the Industrial Program Chair. 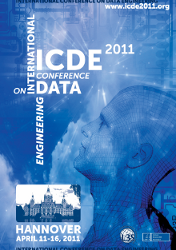 Such proposals should be about a coherent theme of relevance to the data management industry and identify the speakers in the session.&nbsp;</strong></p>\n<p>	&nbsp;</p>\n<p>	<strong>Important Dates</strong></p>\n<p>	Paper submission deadline: July 23, 2010</p>\n<p>	Notification date: October 30, 2010</p>\n<p>	Final papers due: November 30, 2010</p>\n<p>	<strong>Industrial Program Chairs</strong></p>\n<ul>\n<li>\n	Surajit Chaudhuri (Microsoft, USA)</li>\n<li>\n	Volker Markl (TU Berlin, Germany)</li>\n<li>\n	Sergey Melnik (Google)&nbsp;</li>\n</ul>\n', created = 1433152008, expire = 1433238408, headers = '', serialized = 0 WHERE cid = '1:853787a65a36e96b8c77a6cf27d6ea77' in /var/www/other/ICDE2011/includes/cache.inc on line 109. The industrial track is the forum for high quality presentations on innovative commercial software for all facets of information technology. We especially encourage submissions on commercial software or industrial-strength prototypes that are in wide use. These include significant applications leveraging database technology, innovations in data management platforms (including cloud data services) and middleware. Contributions on analysis of usage and effectiveness of existing technology/systems, best practices in the industry, perspectives on industrial trends and directions are welcome. We also invite proposals for entire sessions, to be sent by email to the Industrial Program Chair. Such proposals should be about a coherent theme of relevance to the data management industry and identify the speakers in the session.